Pachadi refers to a traditional South Indian side-dish. Broadly translated, it refers to food which has been pounded. 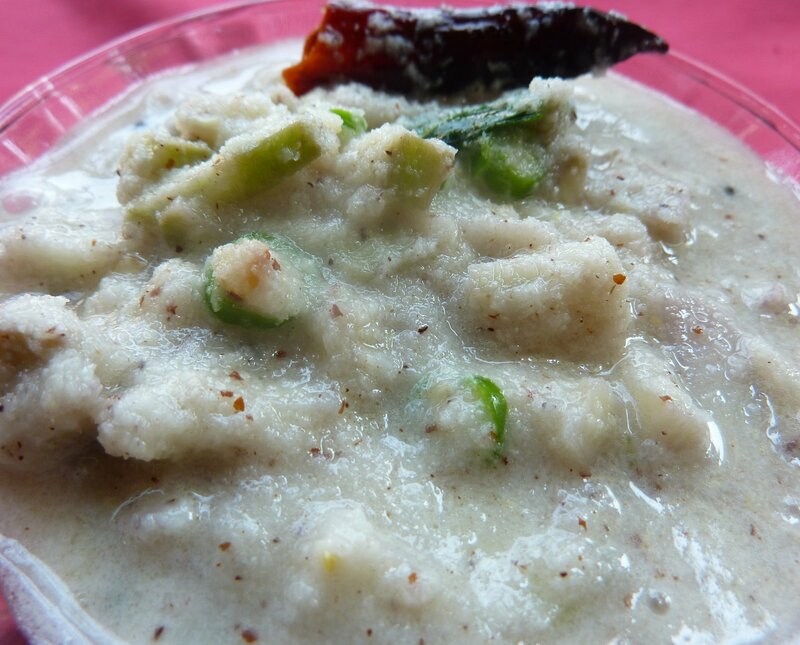 Pachadi is a side-dish curry similar to the north Indian raita. In the states of Kerala and Tamil Nadu, pachadi is eaten fresh and typically made of finely chopped and boiled vegetables with coconut, green or red chillies and tempered in oil with mustard seeds and curry leaves. Pachadi is commonly eaten with rice and a lentil curry. Soak the chopped green mango in water for 10-15 minutes(so that the sourness gets reduced). Meanwhile blend the grated coconut, salt and ½ tsp mustard seeds in a blender to a smooth paste. Drain the water of the green mango and add the prepared paste of coconut and mustard seeds to it and mix well. Add chopped green chillies and mix again.Keep aside. In a pan heat oil and add remaining mustard seeds to it and allow to splutter, now add the curry leaves and dry red chillies and pour this on top of the mango mixture kept aside. Mix well again and serve with Steamed rice.